Got here from the WP7 Physi Bricks game? Need help? Check out our walkthrough videos. Created my first game…ever. It is for the Windows Phone 7 and has been released since October 7, 2011. So far, it has climbed to 1st place in the Free Games category and 1st place in the Free Apps Category. The game is called Physi Bricks. It works like a slingshot. Touch and hold your finger in the bull’s-eye, then drag your finger out of the bull’s-eye. You should see arrows showing the direction and strength that the ball will fire. Take your finger off the screen to fire. Does that game use the G-Sensor’s? Have you tried it on a tablet PC? No use of G-Sensor’s. I had another game idea that I was thinking I would use the G-Sensors in. I am interested to see how accurate they are. Do you think many people enjoy games that use the G-sensors? I have not tried it on a tablet PC, because I don’t own one. Awesome game. Love the new levels. Keep ’em comin’. How many impressions are u getting per day ? maybe u know the flash game blosics, bl…(2) and bl..(3)? Did u develop these games? 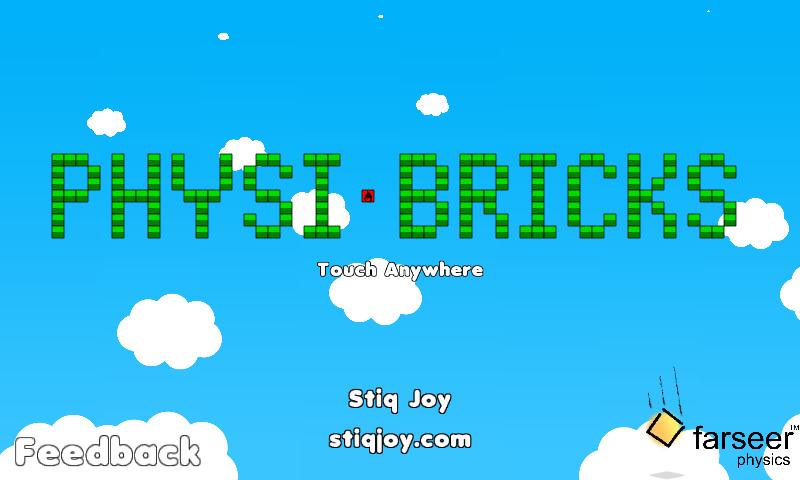 physi bricks is more interesting game than angry bird ,, its really nice game playing on windows phone nokia lumia 800. Please, a version for Samsung Bada OS (Smartphone) is planned? Thanks and, please, excuse me my poor english. Addicted to this game I am! Oh, shoot. Your comment reminded me that I haven’t uploaded those walkthrough videos. It totally slipped my mind. Thanks for letting me know about it! this has to be the best game I am so addicted I hope I dont get fired. You should be able to see them now. All levels have to be approved before they appear in the Community Levels area. We slowed down on approving them, as we were waiting for a performance fix the Community Levels screen to go out. Your levels should be there now. Also, there is an update that will speed up the Community Levels screen considerably. Just got the Walkthroughs videos up there. You should be able to get to them from the phone now. Installed the game today on my Lumia. where’s walk through for lvl 61+…? Sorry, I finished the videos yesterday, but forgot to upload them last night. I’ll be uploading them today, and you should see them tomorrow sometime. The walkthrough videos are up there now. Its a GREAT Game for WP7. But when it resleases for PC???????? I don’t know when I will be releasing it for PC. I’m still very focused on building games for WP7. Simple, challenging. Nice that u still don’t publish the last videos hehehe so I have time to beat them without help. Thanks for sharing with us good game. I like it. I apologize for the crashing problem. I have tens of thousands of crash reports for that very issue. It effects the game in countries where decimal number formatting is different than the US. I submitted a fix for this on Wednesday of last week and am waiting for Apple to approve it. I hope you will hang around for the update. I have just done the upgrade and all my levels have been cleared, why is this I was on level 218! If you click the Settings button in the top right of the Title Screen and then click the “Logout” button and then go to the Normal Levels, do you see your scores again? If so, click the Login button again, and it should prompt you saying something like “You have 2 Higher Scores on the Local Profile. Add those Scores to your Facebook Profile?”. When it says this, click the “Yes” button. This will copy all of your local scores to your Facebook Profile. Please let me know if this solves the problem for you. No more walkthrough videos, at least like we had before. Instead, you can now click the Help button to go to the Level Complete Screen. On there you should see 3 tabs on the left, “Friend Scores”, “All Scores”, and “My Scores”. On any of these you can click on a score, and if it has replay, you can then click the “Watch Replay” button in the bottom right of the screen. Basically, with replays, there is no need for walkthrough videos, since you can watch other peoples replays and see how they beat the level. Only if you log on too facebook? I wanted to give you a heads-up… Your game has been serving up adult ads over the last few days. It’s not just your games – AE Mobile games have also been doing this (and the same adult ads at that), so I suspect it’s an issue with your third-party ad provider (unless you just decided to start serving such ads!). I’m hesitant to complain too much about such an awesome free game, but I figured I’d let you know. Feel free to email me if you need more detail. Hmm, that isn’t cool. I’m currently using “Microsoft PubCenter” to serve ads and have been since I first released the game in 2011. I haven’t changed anything in many months now. I’m guessing they changed something on their end. From what I’ve see,n most other Window Phone Apps and Games use the same ad provider. That would explain why you are seeing it in AE Mobile’s games too. i’m playing this game a long time now. but since the last update (a while ago) the game crashes a lot. mostly on replays of other users. But last month it also started crashing on other moments. I also win the achievement ‘community service’ each time i start the game. I don’t now if you are still actively updating the game at the moment, but it’s not very stable for me at the moment. Still love playing the game, so i hope you keep updating it in the future. If you need more info on the crashes , don’t hesitate to contact me.